Successfully Added SISWOO Cooper i7 Smartphone - 4G, MTK6752 64 Bit Octa Core CPU, Over 44000 on the CPU Benchmark Test, Free 32GB Micro SD Card to your Shopping Cart. The SISWOO Cooper i7 Smartphone has 4G support, a 5 Inch 1280x720 Screen, a MTK6752 64 Bit Octa Core 1.7GHz CPU, 2GB of RAM, 16GB of internal memory as well as coming with a free 32GB Micro SD Card. 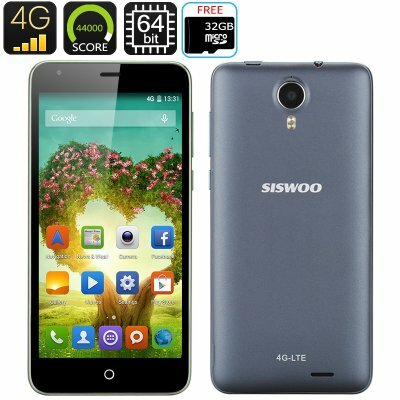 The SISWOO Cooper i7 is a 4G smartphone with an Android 4.4 KitKat operating system as well as a powerful MTK6752 octa core processor. With a glorious 5.0 inch 720p HD display, this conveniently sized Android smartphone will show everything clearly and will respond effective due to having a 5 point multi-touch capacitive display. It runs up two SIM cards in the 4G FDD-LTE/TD-LTE/TD-SCDMA, 3G WCDMA and 2G GSM bandwidths. Take photos or record videos with either the 8 megapixel rear camera or with the quick tracking focus front-facing camera for delivering easy to snap self portrait photos clearly. There is a wake-up lighting touch button that lets you know if you have missed a call or that you have received a message as well. The MTK6752 is built upon a 64 bit octa core 4G LTE architecture thats based on the ARM Cortex A53 processor and supported by 2GB of RAM. Aimed to tackle the competition, the MTK6752 delivers an outstanding performance across all applications and ability ranges, from the most demanding and high end environments to efficiency lead 32-bit applications. Anything you download and install from the Google Play store will have no problems running on this powerful 4G mobile phone. This set up has rewarded the SISWOO Cooper i7 a high benchmark test score of over 44000 meaning it is faster than most branded phones as well as other popular brands. Coming With 16GB of internal memory you should have plenty of space for saving your apps and games that you might have installed. In addition, when you order this smartphone from Chinavasion we will offer you a free 32GB micro SD card that you can insert into the available slot for extra storage space. This product is in stock now, we guarantee next working day shipping and offer a 12 months warranty on all our products. Brought to you by the leader in electronic devices as well as wholesale SISWOO Smartphones, Chinavasion.